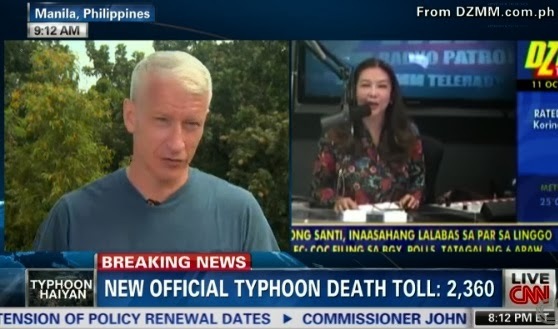 Anderson Cooper finally clarified the much talked about story in media circles today: his criticism of the Philippines government for its lack of presence in Tacloban. In a live broadcast of his CNN newscast AC360 in Manila this morning, Cooper said that Sanchez is "under the mistaken impression" that he said there's no government presence in Tacloban, adding that what he reported merely showed the situation in the city and not a criticism of the Philippine government. Cooper then urged Sanchez, who is in Ormoc for a two-night broadcast for TV Patrol, to go to Tacloban, saying: “I would urge her to go there. I don't know if she has, but her husband is the Interior Minister. I’m sure she could arrange a flight." Cooper also took the opportunity to respond to a speech made by President Aquino, counseling foreign journalists to be accurate in their report and that they should use their role to uplift the spirits of the Filipino people by finding stories of resilience, hope and faith and show the world how strong the Filipino people are. He said that accuracy is what they strive for at CNN, and that in every report they have done, they have shown how strong the Filipino people are. "Filipino people, the people of Tacloban, Samar, Cebu and all these places where so many have died, they are strong not just to have survived this storm, but they are strong to have survived the aftermath of the storm. They have survived for a week now often with very little food, with very little water, with very little medical attention," he said.